Shall we do a Club run? So you have never been on a Club run and wonder if you would enjoy it. The answer is, give at least one, if not more, a try. But what happens if……??? OK, you have a few concerns so, let us try and put your mind to rest with a few answers to these nagging doubts. What is a Club run? We meet up for a coffee and a chat. The organiser will have some idea of a route and a place to have lunch so we move off in convoy if the number is small, or leave at intervals and follow a route sheet. We try to keep away from the main roads and towns and head off into the narrow twisting lanes and by-ways; testing the driver’s use of the gearbox up and down the hills, descending into wooded river valleys, maybe cross a ford; climbing again to higher ground to see the panoramic views across the fields, the rolling hills and perhaps the sea beyond. We may have a loo stop and after about 30 miles or 1½ hours we arrive at a country inn, or garden centre restaurant, for our lunch, or at our picnic venue. After a suitable break we may cover another 15 miles or so to another place before dispersing, or we may wend our separate ways homeward, some members travelling in convoy, along the A and B roads, as they live in the same locality. The run itself will be 30 to 50 miles, a home to home round trip of perhaps 60 miles. We always aim to be off the roads by lighting up time during the shorter days. On every run we pass through small isolated hamlets, villages and view scenery that you are unlikely to have seen before, we may stop for a scenic view. We see the best of springtime wild flowers in the hedgerows and woodlands, the summer sunshine across the landscape and the changing colours of autumn. Above all else we will enjoy driving our ‘Seven’, meeting our friends and seeing the delight of so many folk watching us pass by. During the year we organise monthly runs, often with themes to follow, visiting places of interest for a few hours; so there will be something, or some place(s), to interest each of us. 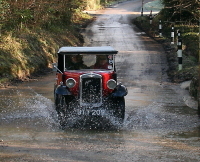 Please, ensure that you have done the regular maintenance as per the Austin Handbook, checked the oil levels, water, brakes, tyre pressures and wheel nuts, that all the lights are working and there is at least 4 gallons of petrol in the tank. It is worth having a small bottle of drinking water in the car to drink on hot days. You may need a general map of Cornwall with you for when we disperse and you make your way home. You should have a few basic spares in the car; plugs, points, light bulbs, and Duck tape, water hoses, a length of wire, a few suitable tools, 1 pint of oil and 4pints of water may be of use, as will some hand-cleanser wipes. 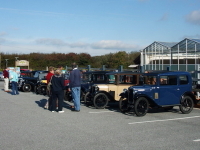 There are a few regulars who drive on runs alone, so just turn up and join in as the organiser will take care of any need for you to run linked up with another car. We do have lady drivers without a passenger, so there is no excuse for anyone to say they have no one with them! That is a non-optional extra with ’Sevens’, we all suffer the same problem so just have a few old towels in the car. This is a very good reason why you should not wear smart clothes. But, if the weather is bad? It is a personal choice as to whether you leave home. The weather in Cornwall does vary within short distances, but we are prepared to call off a run at the start if conditions are too bad; we are foolish to drive ‘Sevens’ at slow speeds, with poor lights, in bad weather for the sake of doing so. We are not into blazers, sports jackets and cravats or expecting to see our ladies in posh dresses, hats, jewellery and handbags. Ordinary everyday jeans, cords, anorak, and anything that you need to keep warm and dry depending upon the weather. Men, you may get dirty if you have a problem on the run. Arrive at the start for the time given in the Club magazine or the Events Diary, you will no doubt see a few ‘Sevens’ already parked in a line and a few folk gathered around chatting. Your arrival will be noticed and the ‘Who is that?’ question will have been asked. All you have to do is get out and introduce yourself. You are now in the group and soon chatting about the car, how long you have had it and what you have done to it. We do not wish to know your life history, or any personal details, other than names and where you are from will be mentioned. You own and drive a ‘Seven’ and that is our mutual interest. Our ‘Sevens’ attract interest and all sorts of folk will wander over and look whenever we park; some may speak whilst others will be reticent and wait for you to speak. You know more about your car than they do so just ask ‘Have you had a ‘Seven’ in your family?’ That is it, you are now into chat mode. 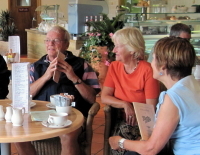 We gradually move into the restaurant for a coffee and a chat, someone will invite you to share a table or just go and sit with someone already at a table; smile and say who you are and the introductions of this group will follow. It is time for the off, but do be sure to use the loo whilst one is available. Out to the car park, start the car and see if there are any instructions, a route sheet or whatever. As it is your first run we will position you up towards the front with an experienced regular keeping an eye on you. If it is a convoy run then you have seen and read the convoy rules; you and/or your passenger should keep the ‘Seven’ behind in sight. If you have lost sight of the car in front keep going until you find them waiting for you. If there is a route sheet, then your passenger can read the instructions and should tick them off as you make that turn, so you will always know where you are on the sheet should you lose contact with a small group at a busy road junction. If you are by yourself you will be following the car in front and they will keep you in sight. Either a pub lunch/snack or a picnic, but that is in the details in the Club magazine. No, we do not sup the alcohol, we are driving. We have all had our moments in the remotest of places, even with the best of maintained ‘Sevens’. There will soon be someone in the group who comes along and starts the diagnostic process, it may take 5 mins or an hour to sort it out and get you going again, but 99.9% of problems can be fixed by the roadside. You will find that you are pushed out of the way whilst everyone peers in and offers suggestions, this is a highlight of the run – relax and enjoy it. Normally, one of our experienced members runs at the back so that anyone with a problem is in front and, if on the right route, will be found. DO remember, if you have the spare part(s) someone can fit it/them. Never rely on others to carry spares for you. Note: not all spares fit every model of the 'Seven'. DO familiarise yourself with the artciles in 'Help at the Roadside' section. YOU will never be left at the roadside to fend for yourself. Even if it is terminal and a roadside rescue service has to be requested someone will remain with you. BUT we do get a little peeved if the problem has been caused by a lack of very basic regular maintenance. So, you have had a great day out with us, enjoyed meeting some nice, friendly people and you now want to come again. Why not, it was quite painless wasn’t it? Now you know us and we know who you are, we want you to come again, so do make a note of the dates in the events diary, even try a few local rallies during the summer. One benefit is that you might meet up with another member from your area and you can travel together to future event start points. This article, written by Andrew Jarmin, Doug Castle and Malcolm Watts, originally appeared in CA7C Seven Focus in Jan 2009 p10-13.